ATM :: Home loan rate reduction, should you opt for balance transfer? Lower interest rate should not be the only criteria for initiating the transfer of your home loan. Sachin had taken a fixed rate home loan of Rs 40 lakhs in December 2013, with 20-year tenure at 10.5 per cent p.a. Although the bank has progressively reduced its home loan rates since, he has not benefited from it as he had opted for fixed interest rate. His requests for converting the loan to floating-rate were declined by his lender. Finally, he decided to transfer his home loan to a new lender, at lower rate of interest. Lower interest payouts: Reduced interest payout due to lower interest rates is the primary driver behind the decision. However, remember that the earlier you transfer your loan, the more will be your savings. Opt for home loan transfer if the savings generated is large enough to leave you with sizeable amounts for further investment apart from covering the cost of transferring the loan. Poor service from existing lender: Poor service from your existing lender can also be a valid reason for you to transfer your home loan. Opt for it if your existing lender does not extend special offers or privileges (even after consistently repaying your outstanding balance) or refuses to bring the interest rates at par with the ones offered to new lenders. Non-approval of top-up loans: Consider switching your loan if your existing lender does not allow you to avail top-up loan. Banks and NBFCs may offer such loans to existing borrowers in case they need funds over and above the existing home loan amount. These are quite similar to personal loans in the sense that lenders don’t monitor the final use of loan proceeds and hence, you may use it for home renovation, buying consumer durable or even for meeting emergency expenses. The interest rates on top-up loans are usually lower than the ones charged on personal loans. Renegotiation of terms and condition: As transferring your home loan is similar to availing a fresh loan, you can negotiate with the new lender for changing some terms and conditions. You can opt for increasing your loan tenure to reduce your EMI or for decreasing it if you are comfortable with paying higher EMIs. However, remember that increasing your loan tenure will increase your interest payout. Freeing up collaterals: As you must have already paid a substantial amount of your existing home loan, your collateral for the new lender should be based on the outstanding amount. This will allow you to free up some of the collaterals. You can then use the freed up collaterals take new loans for your business or other uses. If fees and charges are high: As the new lender will treat your home loan balance transfer as a new loan application, the new lender will charge various fees and charges, such as processing fees, conversion fee and administrative charges. Calculate these charges and compare them with the amount saved on reduced interest payout. If the savings is not substantial, continue with your existing lender. If existing loan is in its last leg: Transferring your loan at the end of its tenure will not make much sense as the reduction in interest payout will be balanced out by the efforts and costs incurred while transferring the home loan. Opt for home loan balance transfer only if the benefits outstrip the costs and efforts involved by a significant margin. Have a frank conversation with your current lender about your intention to transfer the loan. If your current lender agrees to reduce the rates and the resultant savings is more or less equal to the savings from loan transfer, consider continuing with your current lender. In India, 80 per cent of car buyers avail of a loan to buy their dream car. The car loan market is growing at a rapid pace and the leading financial institutions are launching innovative and attractive schemes for the buyers. Buyers have a variety of offers and repayment schemes to choose from depending on their needs. For elasticity in loan repayment, there are options such as the Tata Balloon Scheme, a bullet scheme. Then, there are external top-up options from HDFC or Tata Capital for those looking for money against their cars. Tata Balloon Scheme is for customers who can periodically repay a larger instalment for their car loan. It allows customers to repay a fixed amount in two different formats 11- 1 and 1-11. For a loan tenure of one year, if the criterion is 11-1, a customer pays 11 smaller installments first and then one larger installment at the end of the year. This plan is especially beneficial for those who expect cash flows at the end of a certain period – for example, salaried employees who expect a bonus during a certain month. The other format allows customer to pay one large instalment followed by 11 smaller instalments. Let’s take an example to understand this. Thirty-year-old Karan Singh works in an IT company and has availed of a car loan of Rs 1 lakh. If he avails of a normal repayment scheme, he will pay a fixed equated monthly instalment (EMI) of Rs 8,840 for one year. On the other hand, if he avails of a balloon scheme using the first format, he will pay 11 smaller installments of Rs 7,553 and one larger instalment of Rs 23,800. In the second format, he will pay one larger instalment of Rs 22,800 followed by 11 smaller installments of Rs 7,500 each. As can be seen from the table, the balloon scheme has two sides to it. Depending on the format chosen, either the borrower or the bank will benefit. If you pay the larger EMI first and the smaller later, the borrower stands to gain. If you pay the smaller EMIs first and the larger EMI towards the end, you will end up paying more interest compared to a normal loan scheme. So, borrowers wanting to avail of the Tata Balloon Scheme will do well to choose the 1-11 format. Those who have taken a car loan but are not able to pay their next EMI, can avail of an external top- up loan from banks. They can get a loan against the financed car to get their engrossment brought to a close. So, the scheme has two benefits: foreclosure of your previous car loan and an additional loan at a rate (about 15 per cent) which is cheaper than a personal loan (17-18 per cent). This will be your additional loan amount. Let’s take an example to understand this. Pankaj Rao has a running car loan of Rs 5 lakh from a bank ‘X’. He has repaid Rs 3 lakh to the bank by paying 20 EMIs. Rao requires another Rs 2 lakh to close the loan. According to the eligibility criterion, he can get a top-up of Rs 4.5 lakh. After availing this top-up, HDFC will close his running loan by repaying remaining Rs 2 lakh and also provide him an additional Rs 4.5 lakh. Thus, Rao will become a customer of HDFC by availing a total loan amount of Rs 6.5 lakh. Though the process is a bit lengthier, the top-up scheme can help borrowers purchase their dream car as well as get an additional loan. 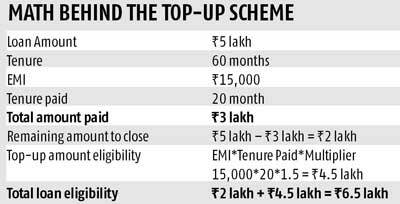 NBFCs are more lenient regarding top-up schemes. Tata Capital, for instance, is a recent entrant into the market. If you have not defaulted in paying 18 EMIs for your existing car loan, you can get a funding of 120 per cent against your car from Tata. If you have a clean track record of paying 12 EMIs, you become eligible to get 100 per cent funding. By availing such options, one can enjoy a certain amount of flexibility during repayment. Borrowers should, however, acquaint themselves with different aspects of these schemes to ensure that they choose the right option and do not fall into a debt trap. For instance, if you are opting for 11-1 balloon scheme, be certain that you will be able to pay a larger lumpsum at the end of 11 months.